Sometimes, what my day needs is a jog. And sometimes, I get home in time to get one in before it gets dark as pitch out here in the country. 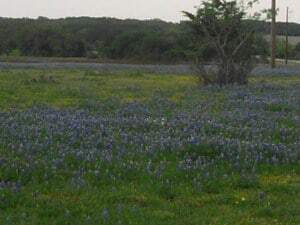 Today, to motivate myself, I tried to jog all the way to the bluebonnets before the sun was too set to grab a couple of pics. 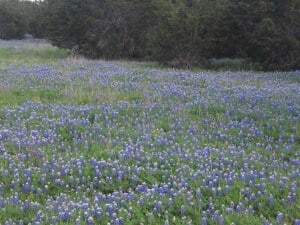 I’d like to make it sound like the bluebonnets are like 10 miles from my house; nope. They are 1 single mile away. It seems really far when I’m jogging and gasping / breathing in the smell of fresh cow manure. I BARELY made it……and I must confess to doing some walking on the way back. I wonder if anyone is surprised that my jogging music is Cyndi Lauper (Girls Just Wanna Have Fun & the Goonies are Good Enough), the soundtrack to Wicked (Defying Gravity), and songs by Kenny Loggins (think Danger Zone). While I love me some John Denver, Leaving on a Jet Plane just was not moving me…literally. TH’s dad was over recently and asked if we were growing dandelions. Growing dandelions? If by that you mean, not mowing them, then yes, we are growing dandelions. Had we thought about it, perhaps we should have harvested them for dandelion soup or at least claimed to have such a plan. Austin hadn’t had any rain for a long time and then suddenly it rained quite a bit. 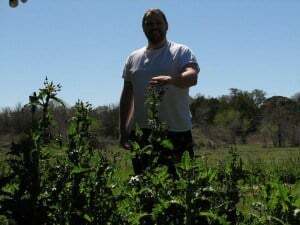 The weeds were out of control….and TH and I had gotten so used to not mowing the nearly dead native grasses in our “lawn” that we didn’t jump right on the mowing thing when it began to be an issue. Observe. 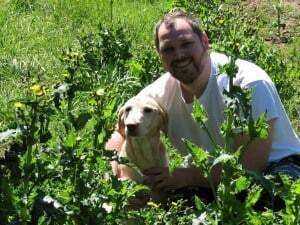 Some people take pretty pictures in bluebonnets, not us, we take pictures in our weeds. That’s how we roll. This pic is for Rebecca, who says that TH’s face is shadowed in all the pictures I have framed of him on my desk. She seemed to be caught between the ideas of him being fake or a spy. I live in the country and we do not have curbside recycling, but since I work in the city and according to my parents have become a tree hugging hippie since moving to Austin, periodically, Truck is loaded up and taken into town so I can recycle on my lunch break. I don’t love doing this because I do not like to be sweaty in the middle of a work day, so I put it off as long as humanly possible. a. It did not all fit in the truck. b. There were what appeared to be half built birds nests in a couple of the bins. 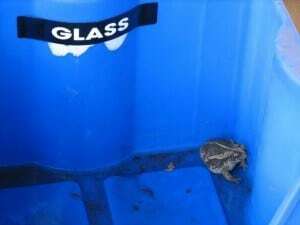 c. There was a lovely toad nestled in with the clear glass. Meghan suggested we put him out by the lake when I expressed concern over his well being. But, I was worried about the possibility of him being separated from his little toad family. 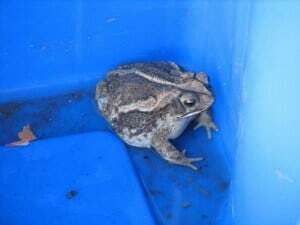 Also, this was likely the same toad that I had saved a week prior so I felt somewhat responsible. TH was mowing the grass when I reminded him about the philodendron next to the porch that he could get close to, but should not cut down. I weeded the grass around it by hand and there was a toad nestled at the base of it. So, if this is the same toad, then he clearly likes to live dangerously and I think my backyard might be his best shot at survival. So, I left him in the bin and Meghan and I went to Taco Bell. I got some cool water and put just enough in the tub that he could be in it if he wanted. We used our used TB wrappers to give him some shade in the back of the truck and added more cool water after eating. Back to work we went, where I parked him in the garage so he wouldn’t get overheated. I drove straight home and put the bin in the flower bed sideways so he could hop away when the mood struck. Within an hour, he was gone. Ostensibly off to get some yummy bugs. 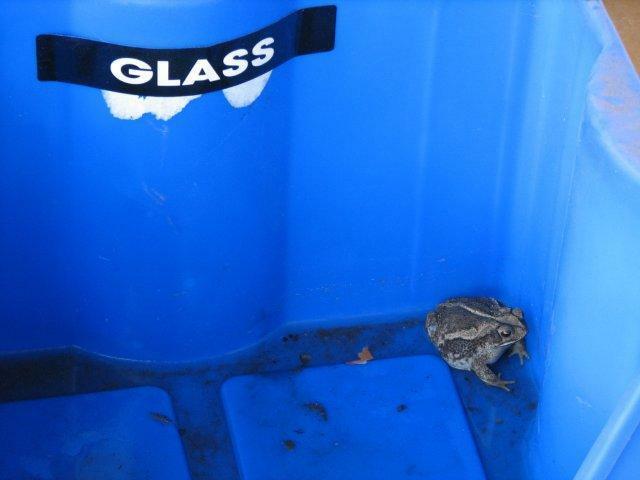 Good Luck, Mr. Toad; glad you made it back safe!